Oven baked Buffalo Cauliflower is a simple appetizer that is great for parties. 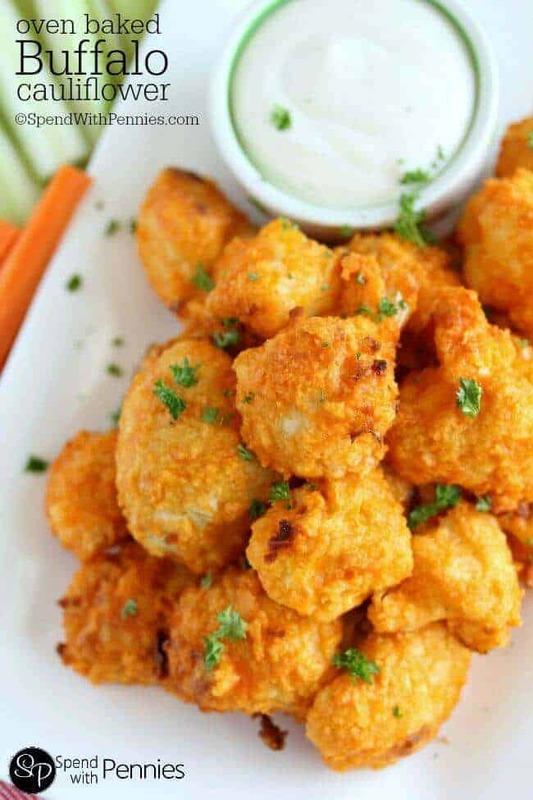 We love making this buffalo cauliflower recipe (with a side of Blue Cheese Dressing) and serving it alongside Jalapeno Poppers and other delicious appetizer recipes when we are entertaining! Who doesn’t love all things buffalo-style? From buffalo chicken dip to buffalo hot wings, roasted buffalo cauliflower is the next big thing and this recipe tastes absolutely delicious! Buffalo Sauce is not the same as just plain ol’ hot sauce out of the bottle. When you order buffalo wings in a restaurant, the sauce is generally 2 parts hot sauce to 1 part melted butter (that’s why they taste so darn good)! Of course you can use a store bought Buffalo Sauce (I love Frank’s RedHot Buffalo Sauce best). It has great flavor (and it doesn’t contain as much fat as a homemade sauce)! You can buy buffalo sauce in a bottle at the supermarket, or make delicious homemade buffalo sauce. If you’re going the store bought route, there are lots of different brands that have their own heat index and flavor profile. If you have anyone in your group who can’t handle the spice, leave a few aside and season with salt and pepper and dip in a garlic aioli for another yummy variation! Prep the cauliflower by cutting it into bite sized pieces and removing any leaves. Mix the coating ingredients together and toss the cauliflower in a plastic bag to coat the pieces. Bake the cauliflower bites for 15 minutes. Take them out, toss with buffalo sauce, and bake for an additional 5 minutes. Fried buffalo cauliflower bites are always a favorite when we go out to eat, but baking them at home is SO much healthier. Any dressing will do, but the best buffalo cauliflower dip is some tangy blue cheese dressing or ranch, because, who doesn’t love dipping, right? 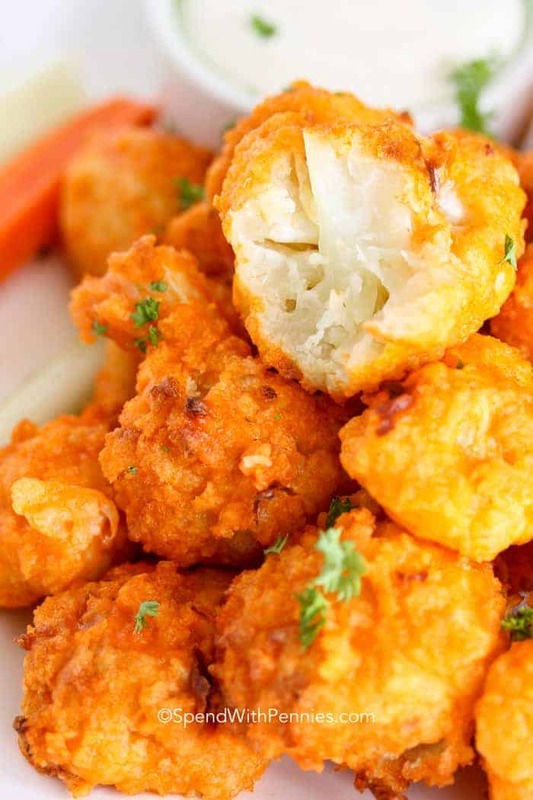 Can You Use Frozen Cauliflower to Make Buffalo Cauliflower? You sure can! Even easier than fresh cauliflower because it will be pre-cut and perfectly portioned! Be sure the frozen cauliflower is thawed all the way before the batter process so that it heats evenly through and drain well, dab any liquid with paper towels. What to Eat with Buffalo Cauliflower? What can’t you eat with buffalo cauliflower bites? Just like chicken wings, buffalo cauliflower bites call for sides of celery and carrots. But, why stop there? Why not make an amazing buffalo cauliflower salad with ranch dressing? It’s also great as a buffalo cauliflower wrap or a juicy sandwich on a hoagie roll with lettuce and some dressing? Dip your buffalo cauliflower bits into some dressing and keep your fingers clean at the same time! If you’re looking to serve a snack big on flavor this is one of my favorites! I do love Buffalo Wings, but I think I love this cauliflower even more (and these are much healthier)! Cut cauliflower into bite sized pieces discarding the core. Combine milk, flour, garlic powder, pepper and olive oil in a large bowl. Place batter and cauliflower in a large Ziploc bag and toss until cauliflower is coated. Pour cauliflower into a large strainer letting any excess batter drip off. Sprinkle with Panko breadcrumbs and gently toss. Place on a foil lined pan and bake 15 minutes. Remove from the oven and gently toss with buffalo sauce. You want the cauliflower coated but not soaked. Note: You can purchase store bought buffalo sauce or mix 1/3 cup melted butter with 2/3 cup hot sauce (such as Frank’s Red Hot). Whisk until combined. Nutritional information provided is an estimate and will vary based on cooking methods and brands of ingredients used.